The Oswestry Heritage Gateway, which works in the interests of Old Oswestry hillfort, is organising no less than four free events for the town’s Heritage Open Days (September 7 -10). On the Saturday of the festival, archaeologist, Dr George Nash, will be sharing his expert insight into Old Oswestry’s 3,000-year-old history in both a lecture and walk. Dr Nash starts with a talk at 11am in Oswestry’s Hermon Chapel about the World War 1 links between Park Hall military camp and the hillfort, where practice trenches were dug for troops to train. At 6.15pm, he will lead a walk of the hillfort, highlighting the significance of the monument through the ages based on its strategic borderland position and expansive views over the landscape. As the Great British Bake Off returns to our screens, Oswestry can enjoy a home-made serving of kitchen antics, with a dollop of history, at a free showing of the Oswestry Heritage Bake-Off film. As part of last year’s festival, the town pulled together to film all the drama, gaffs and innuendo of its own baking competition during a hectic 24 hours. A stellar cast of local talent rose to the occasion, like the stunning cakes created, in film-maker Joey Edwards’ heart-warming story of a unique community celebrating its unique heritage. Film-goers can relive the icing mishaps and soggy bottoms when the curtain rises at Kinokulture Community Cinema on Saturday 9 September at 4.40 pm. As well as cakes, out-takes and plenty of clowning around, brace yourself for tales of dismemberment, a cure for conjunctivitis, and some freestyle WW1 poetry rapping, just to keep it interesting. And watch out for a cameo appearance by Town Mayor, Vince Hunt. For its fourth event, the Oswestry Heritage Gateway is launching an exciting new initiative with John Swogger as part of his year-long Oswestry Heritage Comics project. Set to capture people’s memories and memorabilia of Oswestry past, the Oswestry Heritage Roadshow will be opening its doors at the town’s heritage market on the Bailey Head. The aim is to help cement the links between community and heritage which John’s comics are exploring through their imaginative retelling of Oswestry’s history. The roadshow team will be collecting contributions in writing, or as video or audio recording, on the Saturday and Sunday of the festival from 10am to 3pm. The Oswestry Heritage Gateway will also be launching its newsletter, ‘Hillfort Watch’, with information on the conservation efforts of volunteers working with English Heritage and other hillfort initiatives. 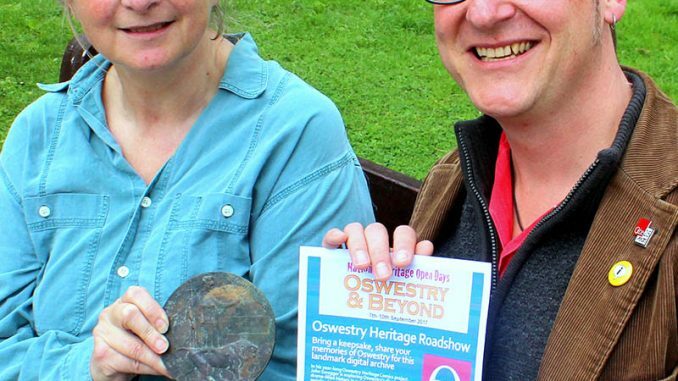 Oswestry’s award-winning heritage programme is headed up by Mark Hignett of the Oswestry Town Museum working with Shropshire Council and numerous groups and historical attractions which form the Oswestry Heritage Forum. This year’s events are more diverse than ever before, with everything from canal trips, bell-ringing and Morris dancing, to steam trains, craft making, and further revelations from the Oswestry Castle Dig. The festival also sees the culmination of two landmark projects providing a glimpse of personal stories of war-time Oswestry. Gilbert and Gordon tells of forbidden love that defied social prejudice and the separation of war, while Men On The Gates uncovers the tragically short lives behind the names engraved on the entrance memorial to Cae Glas Park. Full details of events are out now in the official ‘Oswestry and Beyond’ guide, available in shops, libraries, local hubs and other outlets. A free mini-bus will operate during the festival weekend between Oswestry and the main participating venues. Heritage Open Days runs nationally each year, providing opportunities to access a host of history-themed events, mostly for free, and to visit heritage properties not normally open to the public.